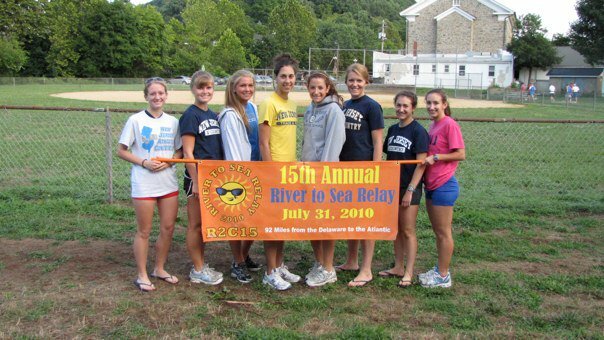 River to Sea Relay 2013! 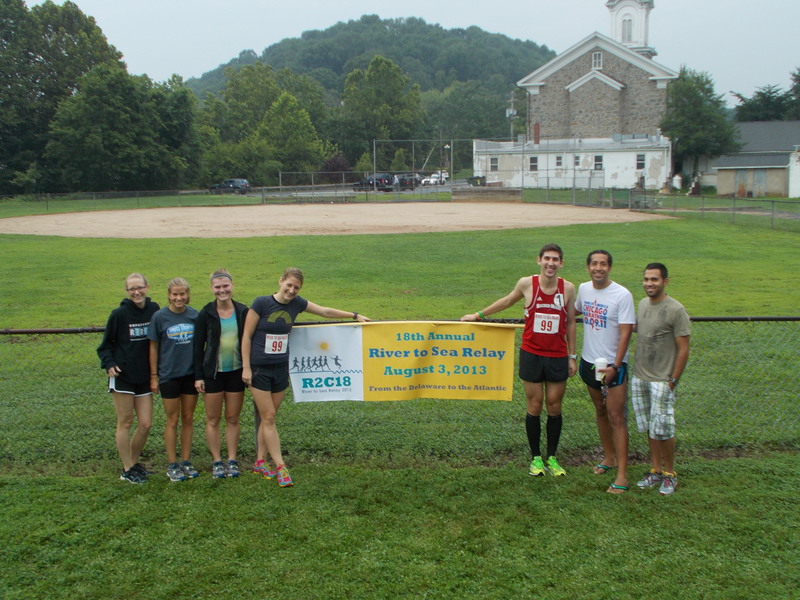 On Saturday, I ran the 18th Annual River to Sea Relay. 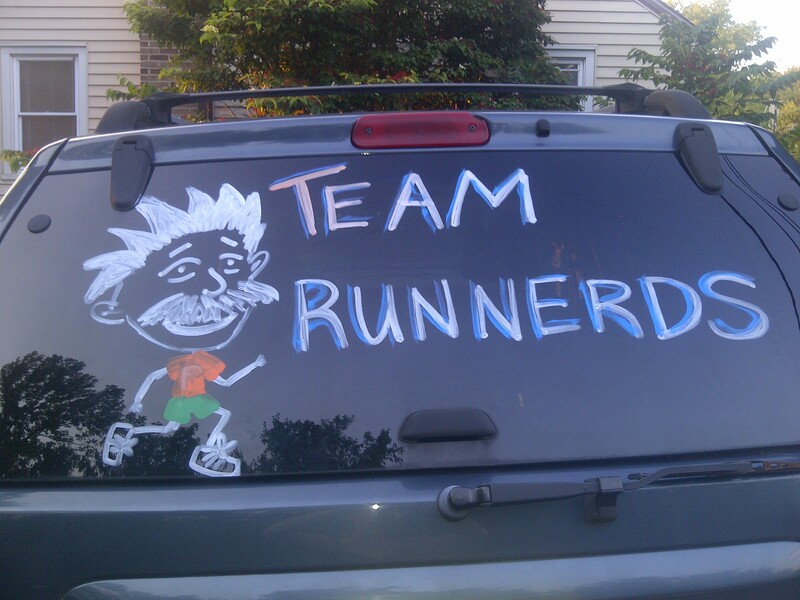 Back in February or March, I rounded up six runner friends to form Team Runnerds. We were an eclectic bunch; not many people knew one another, but they all knew me (this is typical; I’ve never been one to be a part of an exclusive group). For the sake of better understanding this story, I will give a short introduction to my team members…. Brennan: you all know her by now. Steve: he works at a sister Run Co store, and I worked with him at the NYC Marathon expo. Lisa: she was a sprinter and jumper on my college track team and jumped (that pun was only discovered upon proofreading…wow) at the opportunity to try out R2C when I initially posted a plea for team members on Facebook. Marty: he is a regular Intervals attendee and lives along the R2C course. 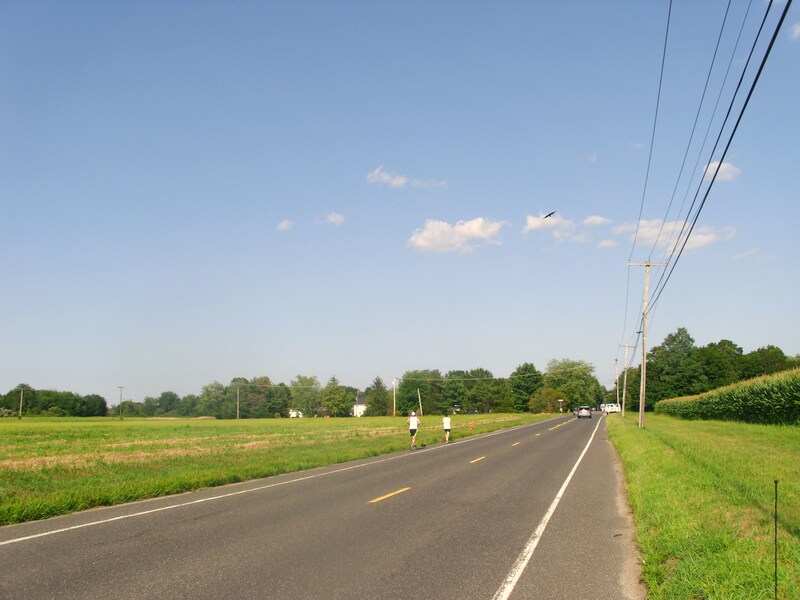 Martin: he has accompanied me on a few long runs this year, including the 13 miler through Princeton, the run to Lambertville (except not really…if you recall that story), and my first two-hour run. He is also the founder of the recoverosa. Emily: a co-worker who I have run many, many miles with over the past three summers. 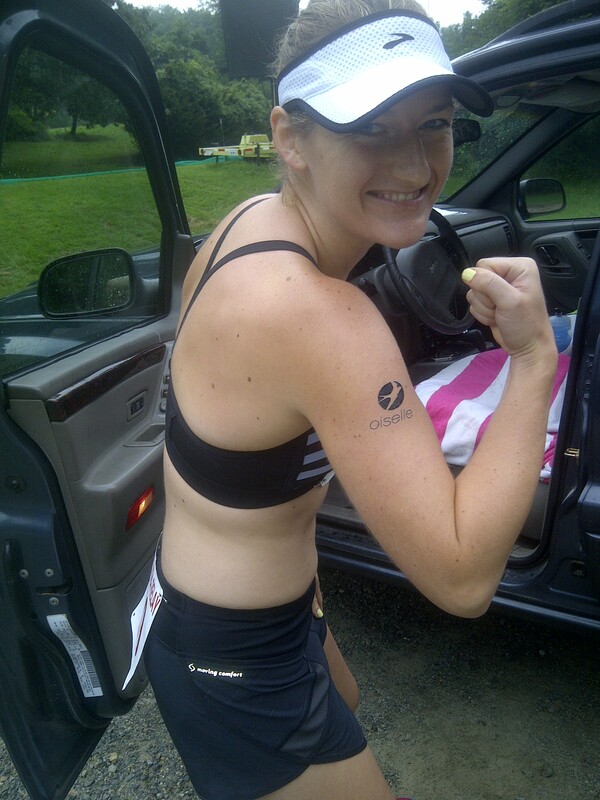 She also filled in for a runner on my college team during R2C in 2011, so she was a veteran. Friday night, Brennan and I prepped by peeling the nauseating film (really) off of her passenger window with help of a hairdryer and a trip to Home Depot. After setting up my living room for a slumber party of sorts, we all finally headed to sleep. We had a 5:30 wake-up call in the morning, and began filling the water jugs and making sure we were set for the long day ahead. Brennan picked up Emily, Steve, Lisa, and me at 6:15 and we were on the road around 6:30. 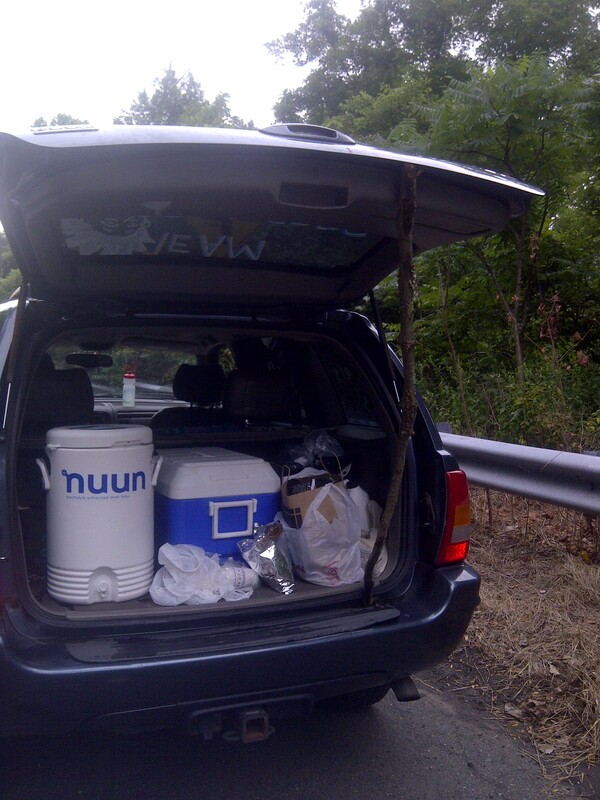 We stopped at Wawa for ice and food and continued on through the countryside to the start in Milford. We were using Martin’s car as our second vehicle, and he picked up Marty. Team 99 at the start! Our start time was 8:30 AM. This kind of troubled me, and others who had done the relay before, because that is late. The race directors assign each team a start time according to their estimated finish time, which is in turn estimated by the sum of each runner’s 5k race times. The slowest teams begin at 6:00 AM, and the fastest at 9:30 AM. Technically there are teams that would start in the 10:00 hour, but they changed some rules, and those teams started at 9:30 and were then purposely held up accordingly midway through. Nobody likes starting late. Most teams fudge a little and write slower times to get an earlier start time….I erred on the side of caution and didn’t write anyone’s PR, but it still got us a relatively late start time. I trusted the officials, though (there will be more to say about that later). Steve ran the first leg…he kind of missed the start due to wanting to warm up to PA acrossthe bridge…but it was all good; only a few seconds were lost. He ran a fairly speedy ~4.8 miles and then tagged off to Brennan to run the leg known as “the Best.” I drove her car during this time, and Steve and Lisa helped to give her water. Next was Martin’s leg on the towpath. There weren’t many places to stop and give him water…we actually had an incident in which he passed us and we missed him! He was running significantly faster than we expected, so we had to meet him at the next spot to give him water! Luckily he laughed about it…and he got some water. It had been pretty chilly in the morning, and now it was steadily raining. 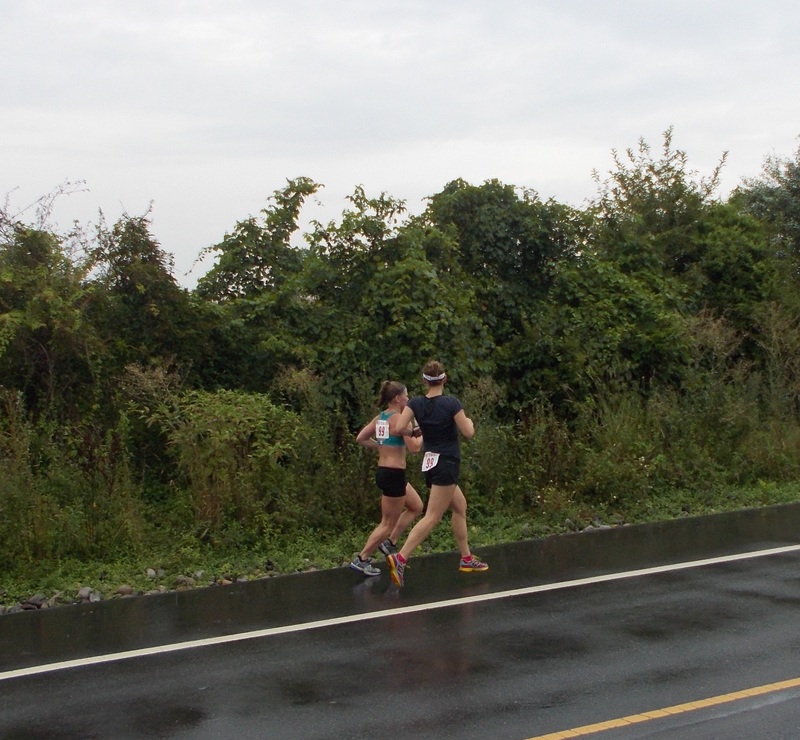 It has never rained during any year I’ve done this relay, so that was strange! The next exchange was at the famed CVS: the start of the Beast! Marty was ready to run through his town one last time before moving to DC. I remember biking up this hill in May and it was pretty brutal. We gave runners all the support and encouragement we could by yelling out the car windows as we drove up the hills and to the next exchange…the start of my leg! This was different than previous years because there was a bridge out on the course…the Beast was forced to end 0.5 mile early, and no cars were allowed to stop at that point. All the stage 4 (Beast) runners were shuttled to the stage 5 start, where the car not giving the stage 5 runner (me) water was to wait for their runner. This all meant that when Marty finished his leg, I would be told to start mine via walkie-talkie. So weird! But it worked. 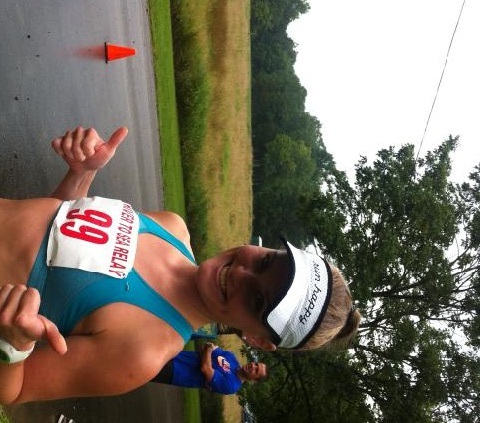 Back when I thought running in a visor would be cool. While the Beast was over, this leg started with more of an uphill than I anticipated. I hadn’t felt like myself all day – I hate it when those days are the days you really need to be on your game! My stomach felt off, I felt like my legs were tight and swollen, etc. But whatever, I had to get it done. My shins were tight for the first couple miles, something I used to experience all the time but haven’t in awhile. Figures. It was still raining, but that was kind of nice. The part of the course before downtown Hopewell I wasn’t entirely familiar with, but it was just an uphill stretch through the woods. Heading into Hopewell I was in familiar territory, and I was excited to run through it. I have memories from this spring and earlier this summer of some fun, sunny, relatively happier times in that town (but whilst injured), and it felt fitting to barge through it now on foot in the rain. Around two miles or so into the stage, a deafening sound emerged directly to my left. Since Boston, I have been scared out of my mind any time there is a sudden loud noise, so this was not something that I should have witnessed! 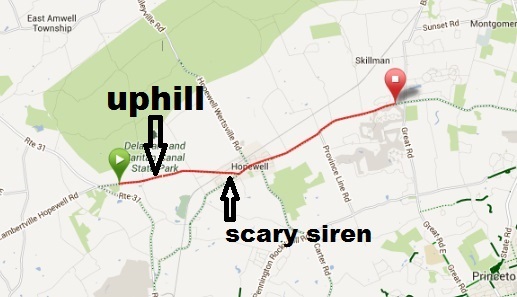 Apparently Hopewell uses a siren on a tall pole to notify area fire stations when there is a fire (or was it noon…?). I figured this out pretty quickly when I saw the thing, but it was still jolting. It also caused me to pick up my pace by about fifteen seconds a mile…. Brennan giving me water that I probably didn’t take (sorry! Thank you!). feeling better post-siren. I had yanked off my visor and given it to Brennan early on…apparently I like the idea of running in visors…but not actually wearing them. Who knew? The leg was supposed to be 6.2 miles, so the finish in Blawenburg came up on me super quickly. I sprinted it in when I realized that, and tagged off to Emily. My Garmin had only 5.95…oh well? Another thing to note: I didn’t see a single runner during my leg. What?! That wasn’t cool. I expected by stage 5 to be able to run with, get passed by, or pass at least one other person! 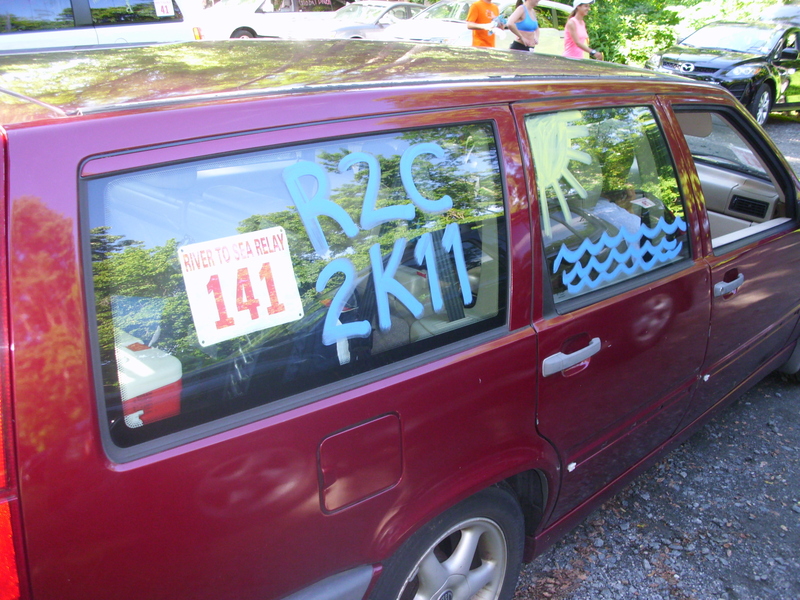 I saw a lot of cars donning R2C bib numbers though, most of which honked as they drove by. I found this stick on the side of Route 29 during stage 2 and it worked perfectly…. take Lisa to her start. It was still cool and rainy; quite a change from the heat everyone had experienced this Saturday every other year! 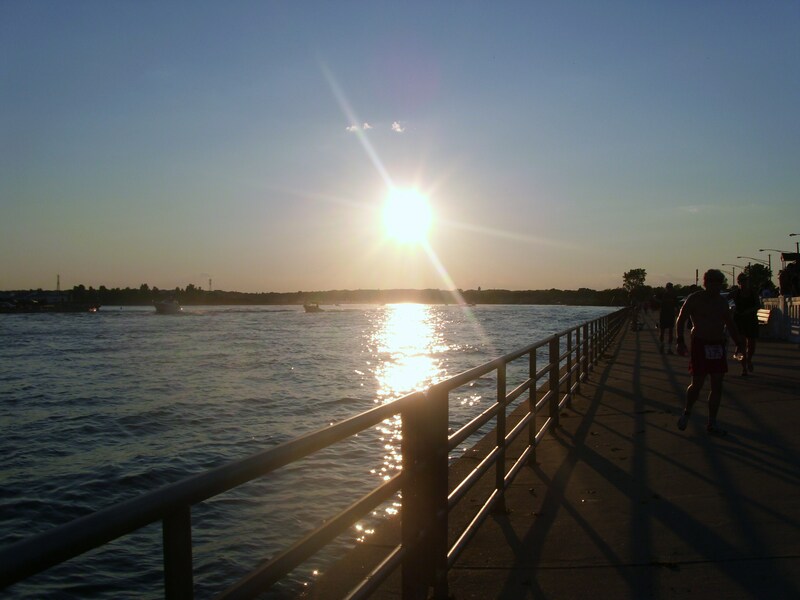 At Forrestal, we saw lots of other people we knew, snapped some photos, and ate a little lunch out of the cooler. Lisa’s leg was short and sweet, ,just 3.9 miles. 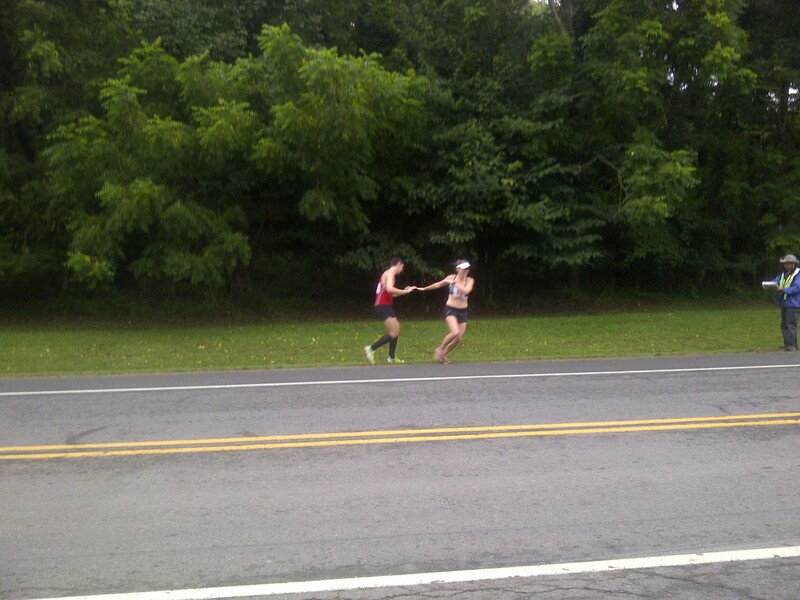 She “handed off ” (there was nothing to actually hand off) to Marty for “Oasis”: the first leg of the second half of the relay! 5.5 miles later and Marty was finished for the day. The ninth leg was the dreaded “long and hot,” which Steve ran. Luckily, today it was not so hot, but it was still long (9.1 miles). At the next exchange, we saw more people we knew, and took more pictures…. The Wild Card was next! I was the driver for this, and Emily and Brennan were the runners. Brennan started out with four miles…and then we hit traffic. Three years ago, the traffic was so bad for this stretch that one of our runners ended up doing an extra two miles because we couldn’t catch up to her in time to switch runners! Luckily, it subsided after a busy intersection and both of them were able to alternate miles as planned. They took turns running two miles at a time after Brennan’s first four, and seemed to have a lot of fun doing it! Oh, and it got sunny, if you were keeping track. The Wild Card is a stage I think I would not normally choose, just because of the open-endedness of it, but I probably should try it someday for that exact reason. Relay in a relay! Aka Wild Card leg. us off, mostly because our designated start time left us with a twelve-hour maximum to get from the river to the sea, which is a 7:54 average. While that sounds reasonable, it doesn’t leave room for runners who end up going an average-run pace for whatever reason, or end up stopping due to sickness, injury, etc. I don’t think we ever had that pressure of a sub-12 requirement before, with similar-speed runners…making us deduce that they screwed up with giving us an 8:30 AM start time. Anyway, after that whole mess, Martin ended up doing his second leg (“Do-or-Die” – my favorite!) while we drove to my start. Finishing up the 91 miles! That same race official showed up there as well, firing me up to do my leg as fast as possible to prove to him that we would finish way before 8:30 PM. Also that they screwed up and we should’ve started at 7:45 or 8:00. Anyway. 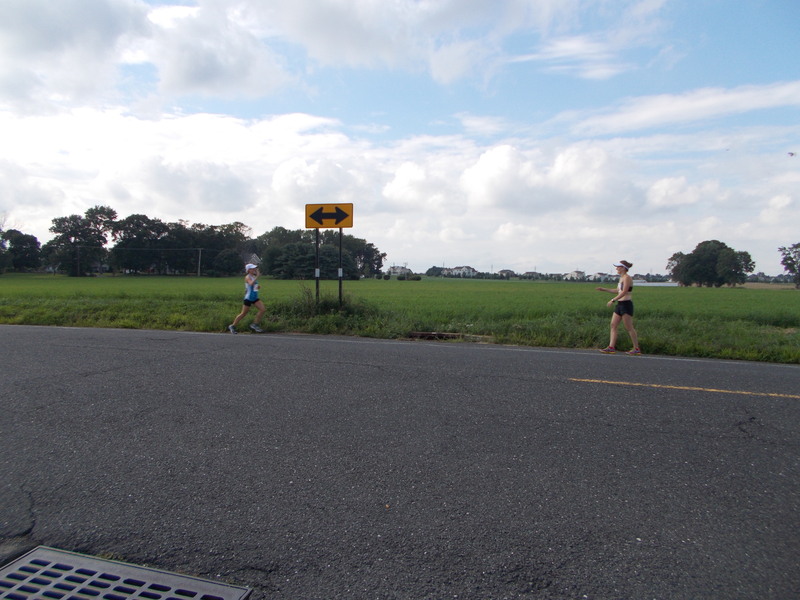 I didn’t really have a plan; the final leg was 2.5 miles with a 2-minute mandatory stop (they did this periodically throughout the race for fairness…New Jersey has a lot of traffic lights!). I was just going to try to run fast and feel decent. And get us to the darn sea, finally. Martin came through on the Allaire State Park bike path and slapped my hand. I set off and tried to control my pace at least for a mile or so….Overall, I felt pretty spent and was breathing harder than my first leg, but I was satisfied with my effort on the day that it was. Above all else, I was so, so grateful to be running River to Sea in the first place, after all the doubts I had only a month before (just my first day back after 7 weeks of injury)! Jumping in after a long day’s work! 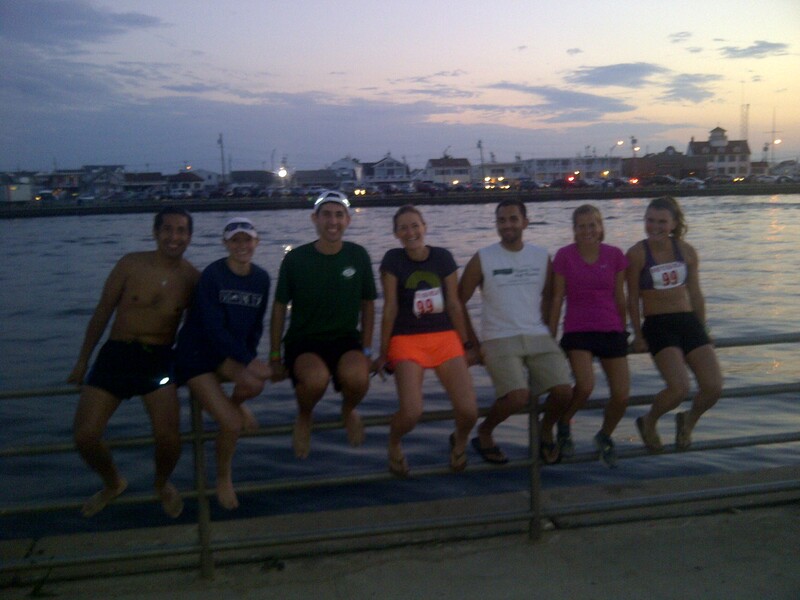 Our team finished the relay in 11 hours and 19 minutes (average pace of 7:27). 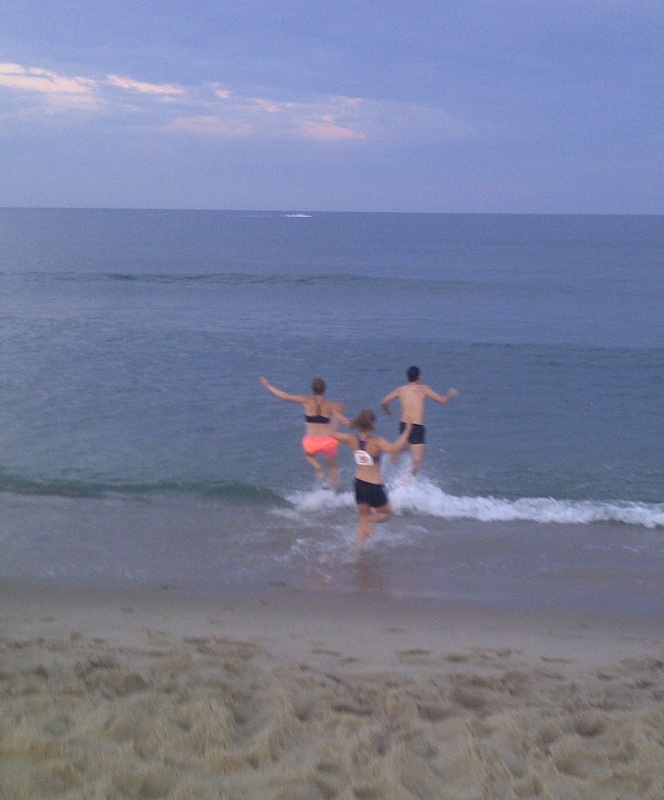 We celebrated with some pizza, a jump in the ocean, and a longggg car ride back in the dark. Running Co. pic! 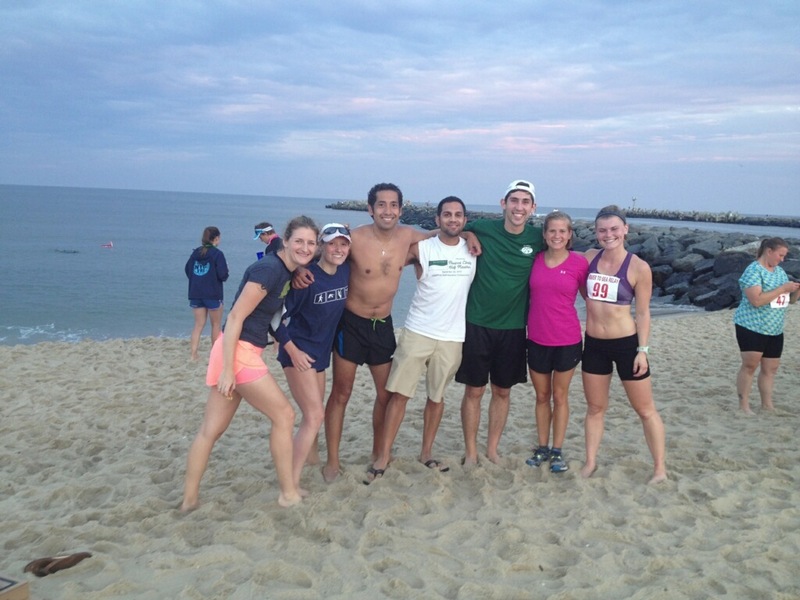 We managed to have five employees on four different relay teams! Everyone at the Inlet before we left. River to Sea is easy as pie (pi was cut off from the frame, oops). EINSTEIN RUNS. I was accused of giving him “Guido hair,” so we fixed it later. River to Sea was so much fun as usual, and it was like a warmup for HOOD TO COAST, which I am getting sooo pumped up for! I fly to Seattle two weeks from tomorrow!!! Big news for my favorite running buddy! 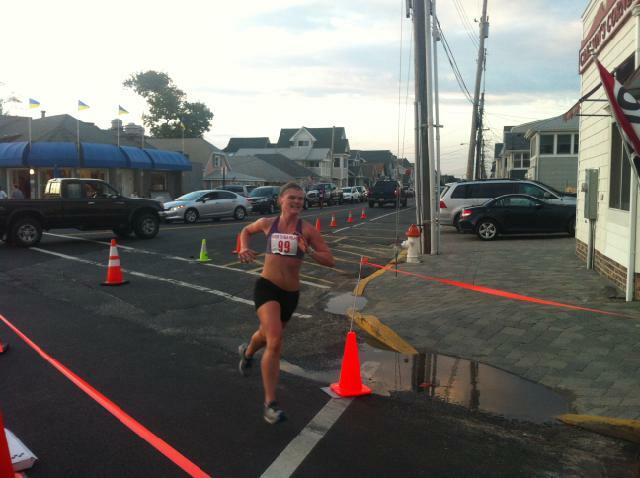 Author Meghan @ Shoe StoriesPosted on August 7, 2013 August 7, 2013 Tags race report, relay, River to Sea7 Comments on River to Sea Relay 2013! 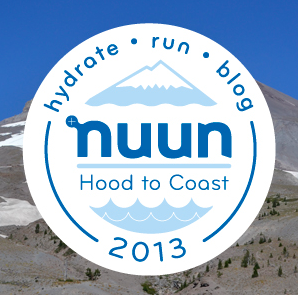 If Hood to Coast is the Mother, then River to Sea is the New Jersey cousin who doesn’t get all that much attention anywhere else, but is a big deal here in Jersey. I can’t believe it’s in just TEN DAYS! Because it’s not a Ragnar, or American Odyssey, or Reach the Beach, I thought I would give a little rundown on the event for all of you who aren’t familiar with it…this is probably most of you. 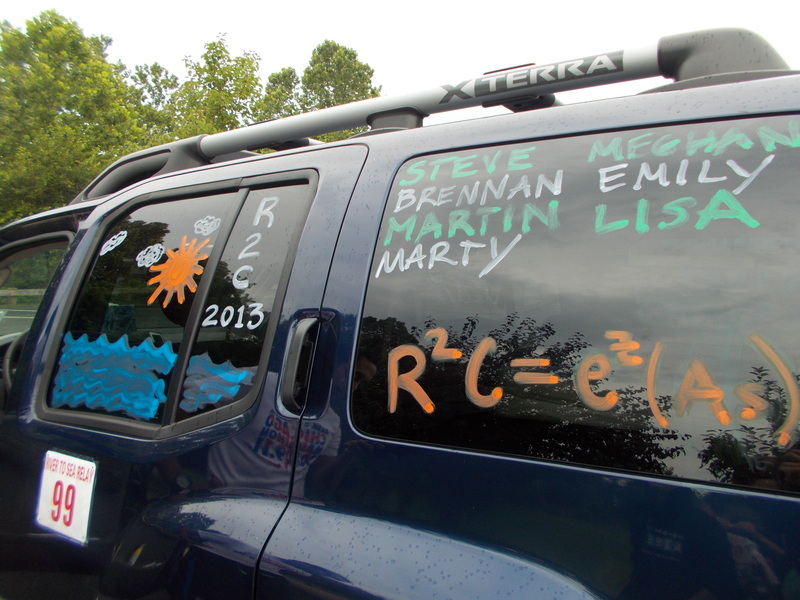 The relay, known as R2C, is about 90 miles (give or take for detours, etc.) and starts on the Delaware River in the sleepy riverside town of Milford. It heads south on Route 29, the highway that hugs the Delaware closely, until it veers east in Lambertville up Route 518. Eventually it ends up passing through my territory, cutting through Skillman, Kingston, and Princeton Forrestal Village. 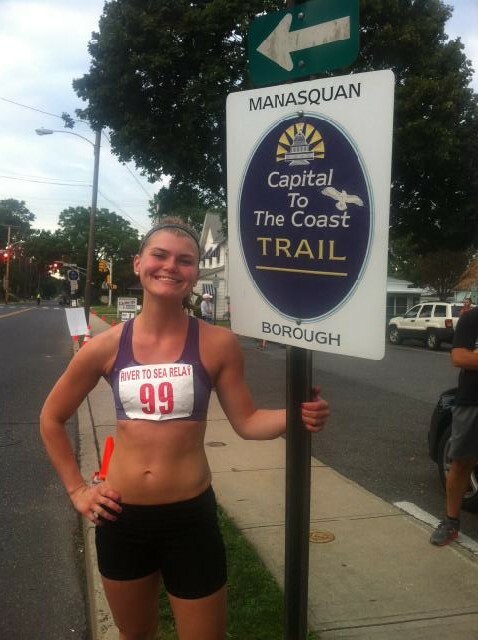 Then the course hits up some Monmouth County towns and Allaire State Park, and ends at the beach in Manasquan. There are two vehicles per team, 145 teams, staggered start times, seven runners, and fourteen legs. 8. 5.5 mi: Oasis – over half way! 14. 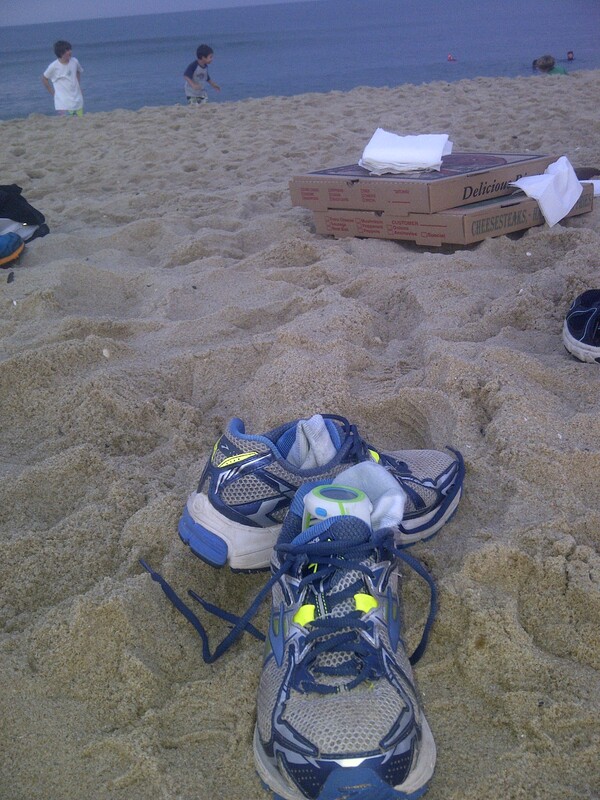 2.5 mi: final sprint to the sea! I’ve been a part of the relay for the past three years, and each year had its own stories…. I was just the driver this year. We did the last…85 miles with a donut because of a flat tire at the first exchange zone. Was the team name a bad omen? This was a pretty awesome day for me. 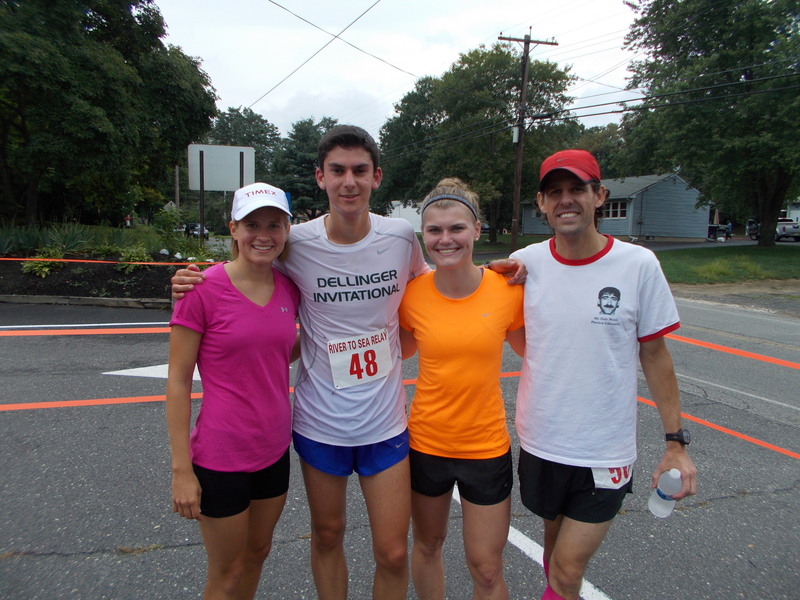 I averaged 7:05 pace, and we had a ton of fun. Last year I was asked by a friend to fill in for someone on her team last minute. I had a feeling I was getting a stress fracture in my hip & I had one run left in me…but I felt okay and wanted to try. So, I only ended up doing Leg 2 and then sitting out in pain the rest of the day. I had mixed thoughts about R2C17, obviously, as I was prepared for the day to play out as it did. 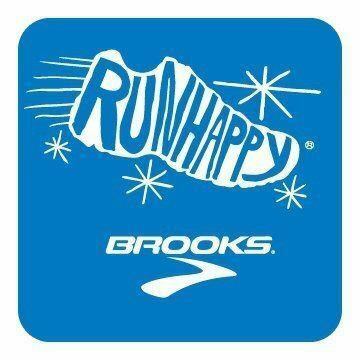 This year, 2013, will be my first time running on a coed team, and I’m excited! I think we have a really fun group…which is a must if you’re going to be spending an entire day in a car with them! 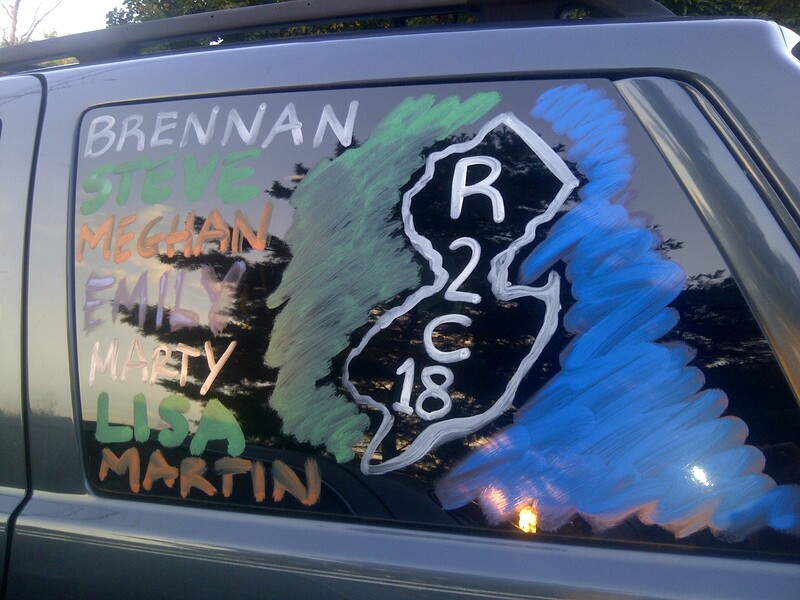 This will be my first time doing R2C and having a blog/Twitter, so stay tuned on August 3rd to see what Brennan and I are up to as we run across the state of NJ (with some help)!